The ideal expansion preamp! The 4-710d features four of UA's tone-blending tube/solid-state preamps, each with their own "1176" style compression switch - plus 8 channels of A/D conversion! Ever since its announcement in 1967, the 1176 has lent its character and punch to some of the greatest recordings in history — creating a solid framework for any mix, in any genre. 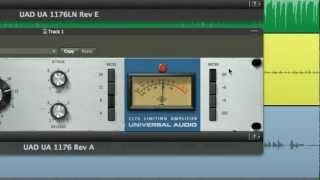 Universal Audio released its first 1176 plug-in emulation in 2001 and inspired a decade of analog emulation software. Today, we've circled back to the 1176, and modeled its entire electronic path from stem to stern. The resulting 1176 Classic Limiter Plug-In Collection provides unrivaled emulations of three distinct 1176 units. Universal Audio's EP-34 Tape Echo plug-in gives guitar players and mix engineers the rich, warm tape delay effects of vintage Echoplex units, now on the UAD-2 Powered Plug-Ins platform for Mac and PC. 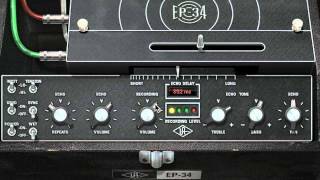 This video covers the basics of the stunning EP-34 plug-in, and gives a glimpse into its inspiring vintage tape echo sounds. 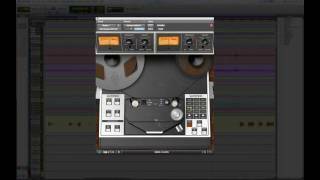 Introducing the Ampex ATR-102 Mastering Tape Recorder plug-in for UAD-2. In this short video, you'll see (and hear) side-by-side hardware to plug-in comparisons, as well as testimonials from artists and engineers on one of the most beloved two-track tape machines ever made. 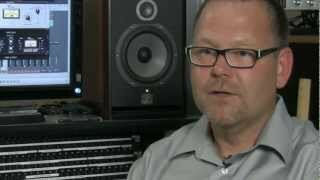 For many top engineers, the Little Labs Voice Of God (VOG) is the ultimate bass resonance tool for mixing. Available for the first time as a plug-in, the Little Labs-authenticated VOG for the UAD-2 platform accurately models the sonic characteristics of this unique 500-series hardware audio processor in every detail. The VOG is used to accurately target and accentuate low frequency material, from vocals to bass guitar and drums — adding both heft and precision. 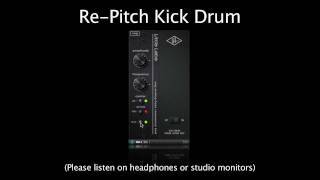 Put simply, it's like a magnifying glass for the bottom end of your mixes. 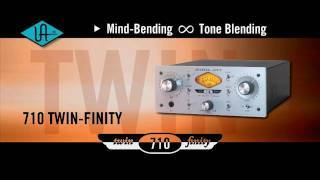 The 710 Twin-Finity™ is a radically new UA pre-amp design which uniquely combines both the classic retro warmth of UA tube design and the transient bite of solid-state in a 2U, half-rack, all-metal chassis. The 710 was created specifically to add the tonal versatility and sonic inspiration missing from generic audio interface preamps. The UAD-2 Powered Plug-Ins platform offers the world's most authentic analog hardware emulations and award-winning audio plug-ins for Mac and PC. Powered by our popular DSP Accelerator hardware, UAD-2 plug-ins deliver rich, analog sound quality that would be difficult or impossible to achieve with native recording systems.From rare compressors and equalizers, to vintage reverb processors and tape machines, UAD-2 Powered Plug-Ins inject three-dimensional "out-of-the-box" analog sound to your in-the-box mixes. 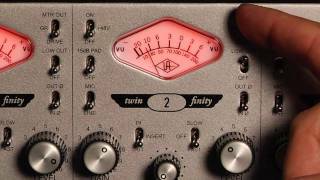 Four Channels of Tone-Blending “Twin-Finity” Preamps & 1176-Style Compression w/ Built-In A/D Converters.